Portfolios have often been used as a way for teachers to monitor and assess their students' progress, but this book picks up on the current trend of using portfolios to assess teachers themselves as part of their degree requirements. As a professional development tool, portfolios are also useful for classroom teachers in evaluating their practice, and in showcasing their skills and accomplishments for use in interviews. 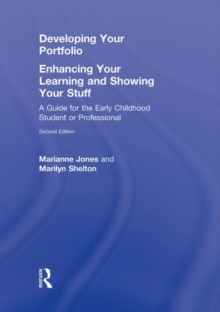 Veteran teacher educators Marianne Jones and Marilyn Shelton provide practical and comprehensive guidance specific to the needs of pre- and in-service teachers of young children. This thoroughly revised and updated new edition features: A flexible and friendly approach that guides students at varying levels of experience through the portfolio process. New material on the portfolio planning stage and additional coverage on the importance of developing a personal philosophy. A companion website with additional instructor materials such as printable templates, exercises for improving portfolio skills, and more. Both theoretical and practical, the book addresses issues and mechanics related to process and product, instruction and guidance techniques, the role of reflection, and assessment strategies. With concrete examples, rubrics, tips, and exercises, this book will provide a step-by-step guide to creating a professional teaching portfolio.